A Note from Fatty: We’re very nearly at the end. No, not of the world, silly. 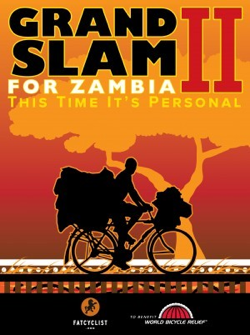 We’re nearly at the end of the Grand Slam for Zambia 2: This Time It’s Personal fundraiser. And we’re still a little — around $8,000 $7,000 $4,000 $3,000 $2,000 — shy of the $125,000 goal for this project. However, there’s still time for you to donate. In fact, if you’ve got a friend or family member you haven’t gotten a gift for, maybe consider making a donation on their behalf. Just go to the donation page, make a donation like you normally would, and after completing the donation, you’ll be given the option to make a card or e-card to give to someone, letting them know you’ve made the donation on their behalf. 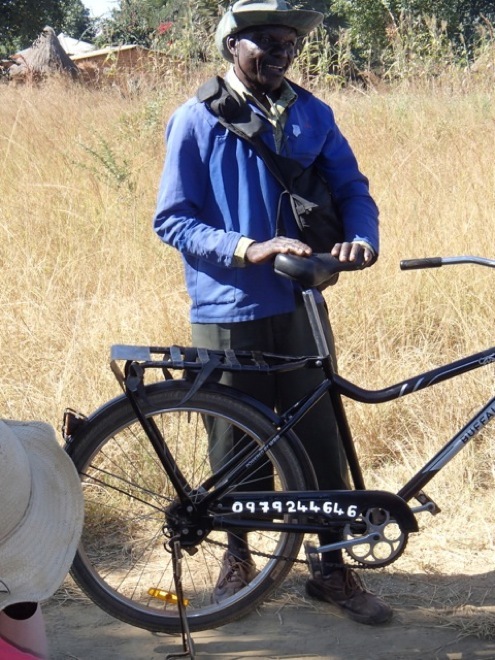 World Bicycle Relief improves the lives of people in Africa in three big ways. The biggest way — the way I’ve focused on in my fundraisers — is bikes for schoolchildren. 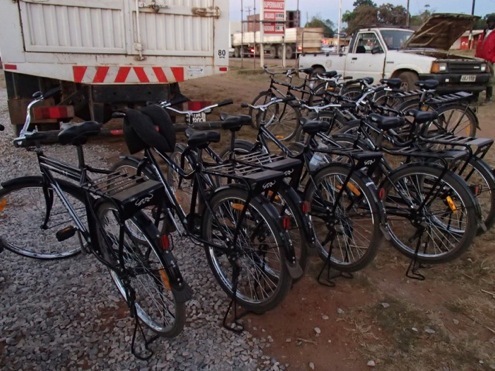 The second way is by providing bikes to community caregivers. Today, I’m going to talk about the third way: the way that shows most obviously the huge economic impact a bike can have: Bicycles for small businesses. Here in the U.S., it’s easy to forget the critical part transportation plays in practically every business, but think about it: in order to sell any product or service, you must be able to get that product or service to your customer. And if you’re limited to transportation on foot, your business is drastically limited in some very important ways: how much you can carry, how far you can carry it, and how quickly you can carry it. 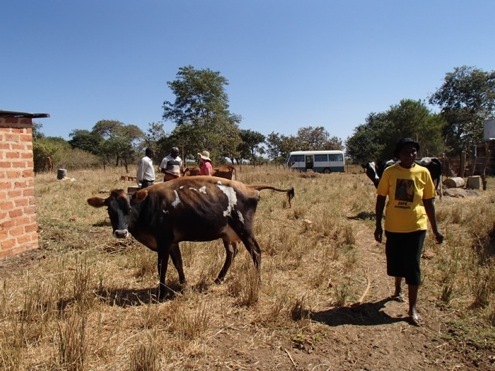 These are big obstacles for any kind of business, but become even bigger problems if you live somewhere (like rural Zambia) where your product is likely to be bulky (like food), and can spoil if not delivered in a timely manner (like meat or milk). 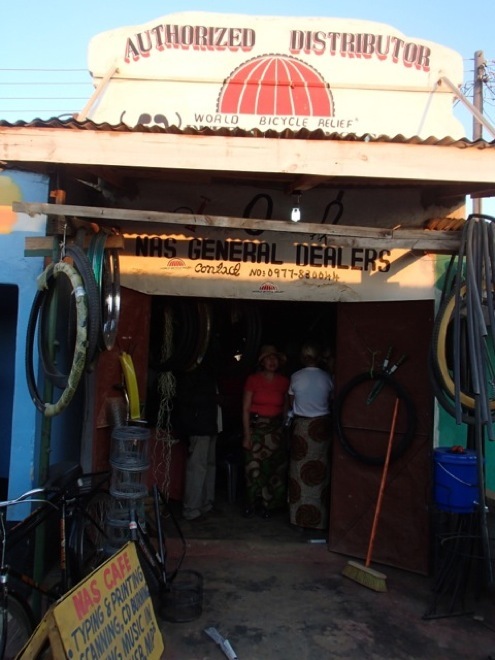 World Bicycle Relief has stepped in with its microfinance project, selling (and financing the cost for 6 – 18 months) bikes to small businesses (often sole proprietors), to help them drastically extend their reach, their speed, and their capacity. But why sell the bike to the small business? Why not just give it to them? Well, it goes back to the “giving like grownups” philosophy that World Bicycle Relief uses throughout the charity. If you give someone something — no strings attached — they are likely to squander it. There’s no cost for failure, no responsibility comes with a gift. If, however, someone has to create a business case and is responsible for making that bike earn its keep, they are much more likely to take it seriously, and make it succeed. World Bicycle Relief doesn’t want to be seen as a Santa Claus figure, magically appearing and giving out free gifts. If people are going into business, they need to buy their supplies; otherwise they’ll always be expecting the next handout, instead of becoming independent. In other words, people play harder when they have some skin in the game. 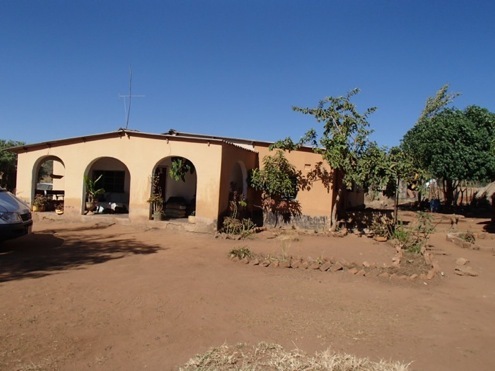 We saw the WBR microfinance project in action during the seventh day of our trip to Zambia. We started the day with a bumpy bus ride to a dairy, where local farmers bring their fresh milk, to be weighed, tested and purchased. 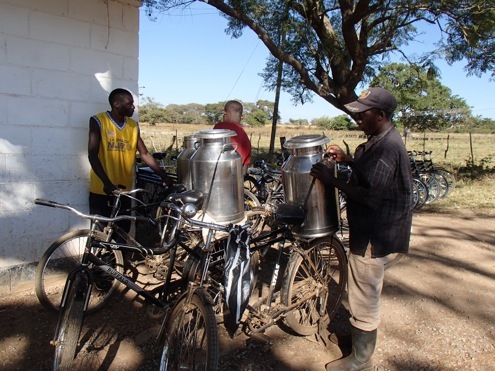 Without bicycles, farmers had a very tough time getting the milk to the cooling facility before the milk started going sour. 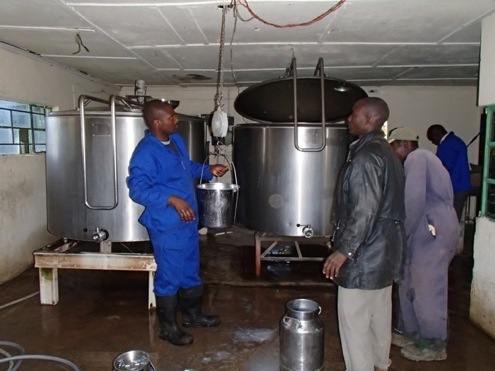 Milk needs to be from cow to dairy within an hour, which is tough to do on foot. And besides, a walk of 4-5 Km while carrying a 45lb urn of milk is no easy thing. 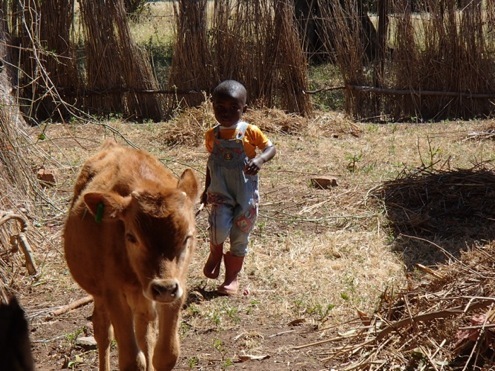 We then went to visit with one of the families who started with a bike, a cow, and a farm, and has — thanks to being able to move more milk with bikes they’ve financed with WBR — now has seven milking cows, two oxen, and three calves. Yes, their house had both plumbing and electricity. 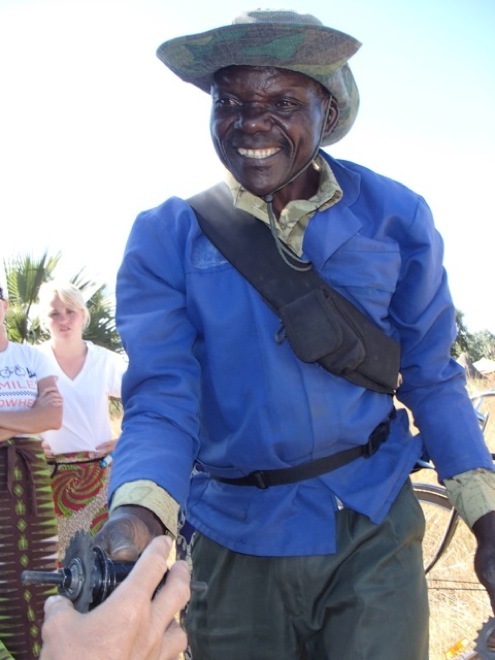 This was by far the wealthiest family we had met in rural Zambia, and while the family’s hard work was the most crucial aspect of this, all the drive in the world wouldn’t have made a difference without the power of good WBR bicycles. Now, keep in mind that this house holds 2+ families — so while this is a huge improvement, prosperity is still relative. They aren’t so rich yet that they can afford to buy bikes outright — they still have to buy their new bikes (which cost about $150) on loan. Each time we met with a family in Zambia, it started and ended by gathering under a tree. The meeting with this family was different, though. With other families, they were mostly just so overwhelmed with happiness at ever having received anything that all they could do was thank us. With the dairy farmers, though, they started with thanking us, but then quickly went on to suggest improvements and lodge complaints about the bikes they had. This was actually really cool, for a couple of reasons. First, because it showed that since they had bought the bikes, they were empowered — they didn’t just have to unquestioningly accept anything that came their way anymore. The second thing was, now they had some bikes, they wanted better and stronger bikes, and were even talking about taking the next step — getting a motorcycle. It was really cool to see how a taste of success leads to an appetite for more success. And it was really great seeing how a family had gone from literally nothing (their first cow was a grant from a Land-O-Lakes program) to being successful dairy farmers with plans to continue growing their business. Of course, all those bikes need to be serviced and repaired from time to time. WBR takes that problem and turns it into an opportunity: for every 50 bikes that are put into the field, they train a person to be a field mechanic. Suddenly, in addition to more people being able to get around better, you also have another person with a new, valuable skill. We got a chance to meet one of these field mechanics, Grayford. He makes a living as a traveling bike mechanic, bringing his tools and skills with him to fix bikes whereever he’s needed. That was the one piece of technology that seemed to be everywhere: cel phones. For example, the man who was having his bike fixed had no shoes, but he did have a cel phone. 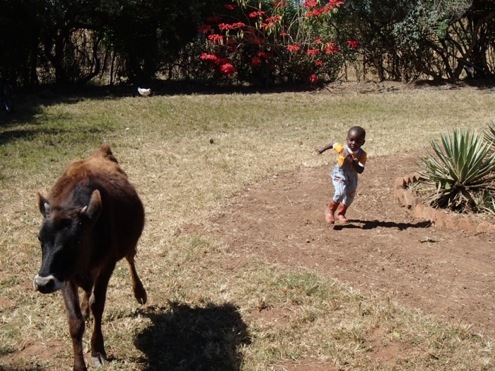 Grayford takes Kwacha (paper money) for payment, as well as chickens, eggs, goats, or whatever he can negotiate. After watching Grayford fix the man’s bike, we went to see Albert, who had opened a bike shop, specializing in selling and servicing Buffalo Bikes (the kind of bikes that World Bicycle Relief makes and distributes) in an open marketplace. Albert was doing so well with his bike shop that he was expanding his business, opening a butcher’s shop in the same market. He also bought — at a discount, because we’d been riding them all week — the bikes we had built and ridden to the market. He already had buyers waiting for each of these bikes. 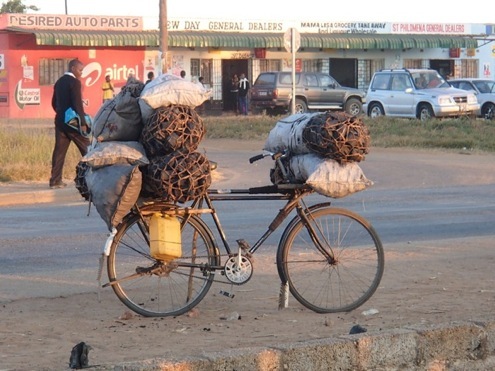 There’s huge demand for Buffalo Bikes, because they’re a lot better built than the cheap bikes that most people have to get in Zambia. WBR has put a ton of work into developing and refining their bike design to make a strong, durable bike that can withstand the demands people put on them in Africa. It was an amazing day, seeing the way WBR is helping not just students and caregivers, but giving people with drive and ideas the tools to succeed. Priming the pump, and then getting out of the way. All with what I am more convinced than ever is the most amazing machine that has ever been invented: the bicycle. Having seen what WBR does and how it’s doing it, I’m a believer. I’m not just running this fundraiser; I’ve donated enough to buy half a dozen bicycles myself (I bought three, which will automatically be matched by the anonymous donors who are matching every dollar in this fundraiser. I hope you’ll find the money to make a donation too, hopefully by Christmas Eve, which is when this fundraiser ends. You may win something awesome, and you’ll definitely change a life for the better. Which is a pretty amazing thing to be able to do. Click here to donate. And thanks. This is SO cool. Two bikes will become four, and who knows the stories that will evolve because of them. Christmas blessings to you, Fatty. “Giving like Grownups.” Love this. This attitude is followed in all of my favorite charities (WBR and Heifer, to begin with). I “bought” a bike for my parents anniversary present – they loved the idea, especially since they know how much riding has changed my attitude, outlook, and health (physical mainly). I cannot wait to see how Eldon did w/ his “prize” drawing on the 24th – I am SO hoping to get an email re: the S-Work bike! Heck, any email would be awesome, but the gift itself gave me a great feeling. I must post again as will surely help my odds in receiving a notification email! Thus far, this is my favorite post regarding the benefits and possibilities provided by WBR! I had to share the pics of the 3 yr old herding the cow with coworkers who know my 3 yr old. 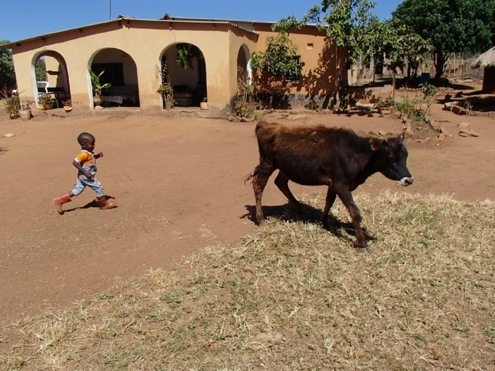 Mine would enjoy chasing the cow but definitely become a game of “chase the cow” without any purpose given toward directing to a specific area! One quick question Fatty: you mentioned they have ability to also purchase the buffalo bikes for (nearly) $150. Why does the price go up for them, and not stay $134? Thanks – love the magic of a buy one, get one “coupon” provided through AMAZING donors. Turned 2 into 4! I’m willing to bet that ‘Albert’ soon had an advertising tag on the bikes…. “As ridden by World Famous Comedic Mastermind”. Did you sign the top tube? @ClydeinKS I’m sure you’ll get your notification right after me. Let’s talk so we don’t both pick the same Twin6 T-shirt. Elden. I’m confident you purchased some bikes for the twins in lieu of more traditional presents. I know they’ll be thrilled by the card. Since I too am contemplating this ‘gift decision’ for my own young kids, I wanted any advice you might have should they not be as excited with this result, as I will be when the email notification comes. @davidh – our notification should come at the same time just so we CAN pick the same Twin6 tee! @Roger – WOW! it is a “hand-up” but still proclaim you Fatty’s Zambian Santa. I would gladly allow your notification to come prior to David and I receiving good word! 6 bikes and 4 toolkits – Woowie-Zowie! And my Mom and Dad are ecstatic about having them given in their name in lieu of another hunk o’ junk for Christmas. I’m sure your Mom and Dad appreciate those clay creations you make today, just as much as that first one way back in elementary school. To them they are irreplaceable art…not hunk o’ junk….but they’ll like there new Specialized bike just as much. You donated in THEIR name…didn’t you? I just got in under the wire for matching donation! I knew I would donate as soon as the campaign was announced, but I like drama and suspense, just like in Fatty’s race reports. At least that’s my story and I’m sticking with it. Wow, that loaded down bicycle — makes me feel bad that I sent my husband off to the post office by car with some packages that I couldn’t fit into my panniers. So Cool! $2500.00 to go! Elden, I’m buying a lottery ticket Friday, so if you are coming up a little short, let me know, I’m SURE this is the week my numbers will come in! Kudos for an awesome job telling the story of WBR and the sustainable. 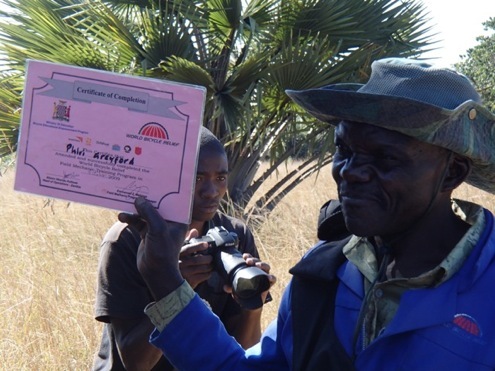 positive impact on Zambian families. And Congrats as you close in on the fundraising goal! Congratulations on goal reached and thanks Fatty for everything you do. Proud to be part of it. I agree with you 100%. When we donate from our fundraising it goes to places that work towards ending poverty with the idea of going from aid to independence .mthat means helping people learn and developing community projects and jobs. Thanks for your good work and keep it going.